Manager Michael Goode was “really happy” as Deeping Rangers took their unbeaten run to 18 league games. First-half goals from prolific pair Scott Mooney and Scott Coupland proved enough at home to Holbeach United on Tuesday night as Dan Dougill’s reply came at the end of stoppage-time. 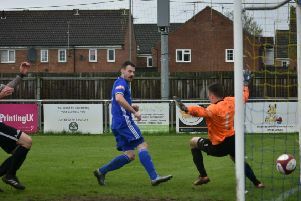 Deeping moved up to second place in the ChromaSports & Trophies United Counties League Premier Division and took their tally to 64 goals over the past three months without a defeat. Goode said: “I’m really happy with three great points. “I thought we played quite well in the first half as Richard Stainsby didn’t make a save. “We were solid and robust but we should have been tidier with our possession in and around the box. “We scored two really good goals, having talked before the game about being clinical against good sides. “Mooney poached the first goal and Coupland got the second which proves if we keep it tight at one end then we are always likely to create chances. “Being 2-0 up against Holbeach is good and in the second half we looked professional in killing the game off. “We had a chance to make it 3-0 when Dan Schiavi should have done better. We scored two really good goals, having talked before the game about being clinical against good sides. “The only criticism is the fact we were giving away too many corners and free-kicks which always offer opportunities. “They scored right at the end but in my opinion it shouldn’t have been a free-kick for handball. Inside the box you wouldn’t be happy to give away a penalty for that. “As far as I’m concerned, we’ll take three points from any local derby with Holbeach. “We’ve come through a couple of tough weeks when people were feeling ill but still playing. Midfielder Charlie Coulson’s knee injury will be assessed but Goode admitted “it doesn’t look very good on first indications”.